You love your stand up paddle board. You love it because it’s your fitness partner, surfing buddy, fishing companion, and may be one of the only things you can truly relax with. 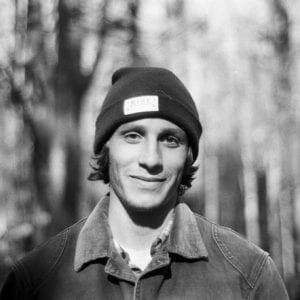 Essentially, your paddle board is a part of your family; therefore, you should want to protect it. There are many best practices to protecting your paddle board, but one of the easiest ways to protect your SUP is by getting a paddle board bag. There are many purposes for paddle board bags and they all have great intent in keeping your epoxy or inflatable paddle board in pristine shape. Unless you live on a lake or beach, you typically must drive to your paddle board destination which requires time on the road. Some people strap their epoxy paddle board to their vehicle while others transport it in the back of their truck or SUV. When traveling in your car, your paddle board should always be in a paddle board bag just in case rocks, stones, or debris hit your board and chip your paint. In addition, the added padding of a SUP bag will help avoid potential damages from strapping your SUP to the roof rack of your car. For those taking their paddle boards on vacation with them, we have a lot of great information about flying with your paddle board. In this specific case, you 100% need a paddleboard bag for your epoxy or inflatable paddle board. Epoxy paddle boards are more vulnerable to damage, therefore, when flying with one, it’s crucial that you pack your SUP bag diligently to protect it from potential damage if roughly handled by airline employees. Also, keep in mind that each airline has different paddle board fees. Airline board fees range from $50 – $150, so choose wisely. We have plenty of information about How to Store Your Board and after reading about the importance of a standup paddle board bag, it will be clear that a paddle board bag is mandatory for helping your SUP live a long and healthy life. There are, however, a few tips and tricks you need to be aware of before storing your paddle board in a SUP bag. The most important thing to do before storing your paddle board in your SUP bag is to make sure it is clean and completely dried off. A wet board in a SUP bag will cause molding and a stinky smell that will be hard to get rid of. To prevent this, use warm water to spray off any sand or dirt, wipe down until completely dry, and leave the bag partially zipped in order for it to have some room for breathability. Paddle boarding on a sunny day is highly encouraged, but leaving your SUP on land exposed directly in the sun is not. If your paddle board is left in the sun for a long period of time it can cause your epoxy SUP to delaminate and make the colors fade. Leaving your inflatable SUP in the sun for a long period of time could potentially pop your board and fade its colors. To avoid this completely, get a paddle board bag. A paddle board bag is the best solution for protecting your epoxy paddle board because it is constructed with heat resistant materials and air vents to prevent heat damage. A UV paddle board sock is the best solution for protecting your inflatable paddle board. With a paddle board bag or SUP sock, you can hang out next to your board in the sun instead of leaving your board in the shade somewhere that may lack full visibility. There are two types of board bags – the all-around bag, which is the most popular type of board and has the rounded nose and the touring bag, which has a pulled in nose and a narrower shape. Most paddle board bags range from 9’8 to 12’ and some can go much bigger for racing SUPs. Rule of thumb: Always buy a paddle board bag that is at least two inches shorter than your board’s length. Ex. If your paddle board is 10’6, you should get a bag that is 10’4 or shorter. Since SUP socks are stretchy, getting a sock that is the same size as your board will work just fine. All ISLE Paddle Board Day Bags come standard with a carry strap, padded shoulder strap, Velcro fin slot, and internal stash pocket for any accessories. Inflatable SUP boards are the hottest knew SUP on the block and allow everyone an equal opportunity to have a paddle board without the luxury of a garage or truck for transportation. Inflatables go up to 12’+ and when deflated, will roll up to a compact size, eliminating the headache of difficult transportation and storage. That being said, it’s still important to use a day bag for these boards as the same concepts of protecting it apply – you will want to protect the condition of the board as well as have an easy way to travel with your board. 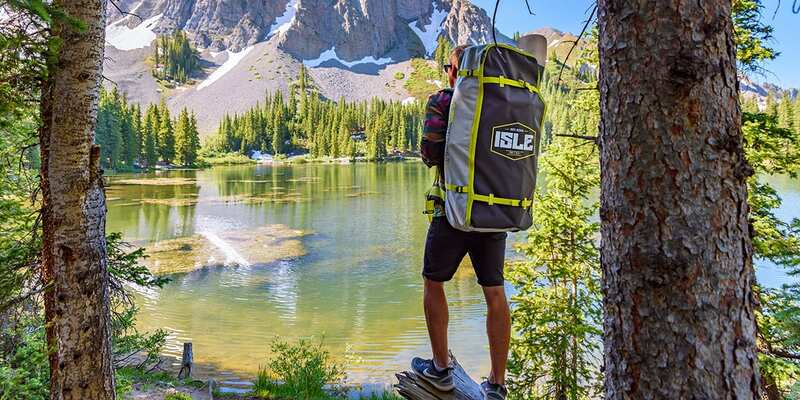 Typically, inflatable SUP bags are like a backpack to make hiking and roaming much easier. Within this convenient travel bag, you can house the board, paddle, pump, fin, and leash neatly inside with some additional room for extra gear. 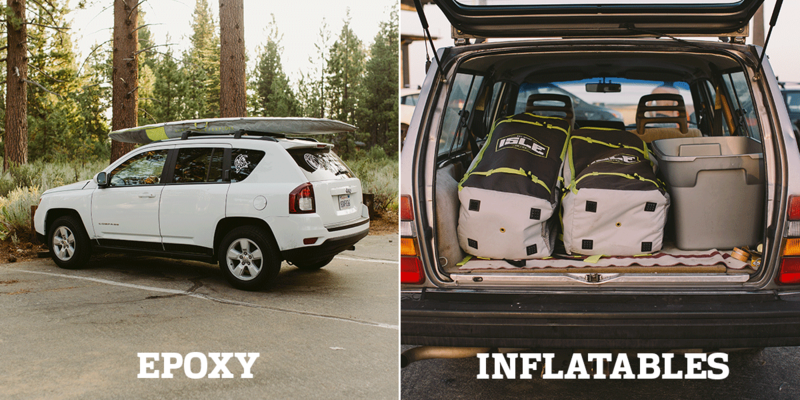 We can’t stress the importance of stand up paddle board bags enough. Most importantly, a paddle board bag will increase the life of your paddle board. A heavy duty SUP bag will protect your board when traveling, in storage, and during a hot summer scorcher. If you want your paddle board to last for the years to come, a SUP bag is a definite must.